1. Use spices to boost flavor. Why rely on sugar for a flavor boost when there are so many delicious healthy spices to choose from? Cinnamon, cardamom, and nutmeg lend a sweet flavor, while savory spices like garlic powder, cumin, chili powder, and paprika are incredibly flavorful and satisfying. Try sprinkling cinnamon on your toast or oatmeal. You won’t even need sugar! 2. Savor a cup of tea. When cravings strike, sometimes a warm cup of tea is all you really need. 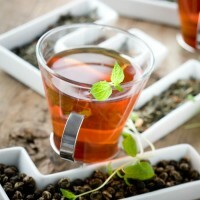 Try a cup of Egyptian licorice mint tea, Yogi Throat Comfort tea, or other naturally sweet teas. These herbal teas are spicy and sweet – no need to sweeten them further. Green tea steeped with lemon and ginger can provide a natural tart treat that will keep you away from the cookie jar. Flavor your own popcorn! Air pop a batch, then sprinkle with toppings of your choice. For a sweet treat, try cinnamon, apple pie spice, or pumpkin pie spice. For a savory mix, try furikake (buy the kind without MSG) or garlic and lemon pepper. Check out these 10 tasty popcorn recipes. Bake a batch of candied pecans to add to salads or yogurt. Heat 1 teaspoon of sugar/maple syrup on a pan over medium low heat, let it melt, turn to low heat, add ¼ cup of pecans and mix to coat. Tip: turn the heat off after the nuts have been coated in sugar to prevent the sugar from burning (it happens quickly!). Add cinnamon, chia seeds (for boosted fiber and protein content), salt (for salty & sweet taste), cayenne pepper, or any other flavors. Watch the portion sizes if you decide to make a bigger batch. These add a nice flavor and texture to salads, yogurt, or oatmeal. Slice up a small banana and top it with these pecans for a snack.